Do you want to create databases using Microsoft Access? Do you want to build a database to run your small business? Do you want to build professional quality databases? Are you considering software development for a new career? Description: Video recorded from our Live Microsoft Access Seminar covering the complete construction of a full-featured database to run a small business. Please note: this seminar was recorded from a LIVE webcast event. The quality of the video is not up to the high standards of our normal 599CD courses. There are a couple of skips and short blackouts during this video, but it is still very instructional. Learn how to build Access databases from the ground up. This course will teach you everything from the basics of building tables and forms all the way up to the more advanced features - and even a little programming. Registration for all seven classes is only $79. The course consists of SEVEN (7), one-hour sessions. Why Microsoft Access? There are a growing number of companies and professionals who are finding out that it is more cost effective to develop an in-house database than it is to purchase a vertical-market application from some distant software vendor. Custom software development ensures that your database is unique to your organization, and will meet your needs for the future. Microsoft Access is the best tool for the job. Who should attend? Anyone who is looking to learn how to organize, develop, and maintain a custom database for their organization, or anyone who is interested in developing databases as a profession. This course is designed for the non-computer professional who has a firm working knowledge of computers, is familiar with spreadsheets (specifically Excel), and is proficient with word processing (such as with Microsoft Word). No prior database development experience is necessary. What will be covered? In this course we will develop a sample business database which will include customer tracking, order entry, inventory, and basic accounting features. You will have developed the skills necessary to run a small business or a department of a large corporation. You will be able to build a database from the ground up. See below for a complete outline of topics covered. Where will the course be held? Wherever you are! That's the best thing about online courses - you can learn from the comfort of your home or office. All you need is a Web browser and Windows Media Player, which is a free download from Microsoft if it's not already installed on your computer (and it probably is). How much is registration, and what do I get? The cost is only $79 per student (quantity discounts available, please call). Registration includes enrollment for the eight-session course and a downloadable, 150+ page workbook outlining everything taught in class. 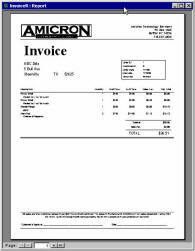 Why Amicron? Why should you trust Amicron for your online training? We have been providing classroom-based training since 1994. We don't just cover the material in some off-the-shelf textbook. We have written all of our own course materials and we know what you need to learn from practical experience. Every computer training company will say this, but we really mean it: our instructors are true experts. We're not just teachers who know computers. We're computer programmers, database developers, and technicians who teach. Who is the instructor? Richard Rost is the instructor for this course. He is a self-taught computer programmer, database developer, and web designer by trade. Richard started his career in computer training working in the technical support industry. He was in charge of training computer technicians to help customers solve their problems over the phone. 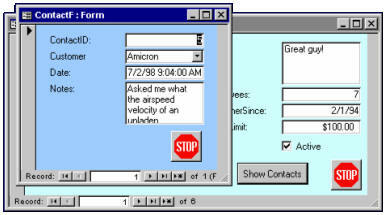 From there, Richard founded Amicron Technology Services in 1994. When he's not teaching, he's building Access database solutions for clients nationwide. He also builds web sites and online databases. In this course we will develop a sample business database which will include customer tracking, order entry, product info, and basic accounting features. You will build a database from the ground up. If this sounds complicated, don't worry. We start slow, gradually learning each concept. By the time we're finished, you'll see just how easy database design with Access really is. Prior experience with a spreadsheet program - such as Excel - is helpful, but not required. PreRequisite: Windows Basics. Students should have a good understanding of how to use Windows, and a computer in general. It would also be very helpful, although not required, for students to have taken our Word and Excel Basics courses as well. While no prior database experience is required, knowledge of how to use a spreadsheet program, like Excel, would be helpful. Note: This course is our specialty. The instructor, Richard Rost, has been building databases with Microsoft Access for nearly 10 years. When he is not teaching, he is building databases. If you're looking to really learn Access, this is the course for you. We skip a lot of the theoretical nonsense and get right into building real-life databases. Topics Covered: Access database components, tables, queries, forms, reports, macros, modules, data access pages, planning your database on paper, what tables will you need, what fields will you need in each table, creating your first database, the Database Window, creating a Customer table, adding fields to your table such as First Name, Last Name, and so on, data types, field descriptions, autonumbers, moving fields, deleting a field, undo, saving your table, primary keys, indexing, entering data into your table, check boxes, resizing columns, saving layout changes, building a query with a single table, adding fields to your query, running a query, switching between design and datasheet views, sorting on a field, sorting on multiple fields, copying a query, filtering query data based on criteria, AND v. OR criteria, interactive parameter queries, data entry forms, specifying a data source for your form, adding fields from the Field List, text boxes and labels, viewing your form, moving and resizing fields, moving a group of fields, working with fonts, colors, and effects, resizing your form, entering data into your form, navigation buttons, reports, creating mailing labels. At the end of this class, we have built a fully-functional customer database, capable of tracking customer information, printing mailing labels, and generating sorted lists of customers by state and other user-specified parameters. Advanced table properties, field sizes, different types of numbers, format, input mask, custom date formats, captions, default values, data validation rules, required values, indexing and why it's important, relating multiple tables together, creating a contact management table, foreign keys, linking tables together using a query, creating field relationships, using the asterisk, advanced query sorting and filtering, building the contact form, using a combo box (drop-down box), the combo box wizard, creating command buttons to open and close forms, the command button wizard, adding pictures to your buttons, creating a Main Menu form, tab order. By the end of this class, you will have built a contact management system to track correspondence with each of your customers. You will also have built a basic menu system for your database. 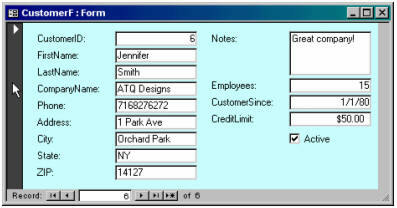 Building an Order Entry system, Order Entry tables, Orders and Order Details, creating an order, entering in some products, calculations in queries, formatting a query column, string concatenation in queries, calculating sales tax, creating an employee table, adding a sales rep to your order, building the Order Entry form, building the order details form, form properties, continuous v. single form view, form headers and footers, navigation buttons, hiding fields by making them invisible, adding calculated totals to your form footers, SUM function, unbound text boxes, creating the subform for order details, relationships, default values on forms. At the end of this class you now have an Order Entry system where you can enter in customer orders and the products purchased on those orders. Creating a product table to store product information, creating a product form, enter in products, adding a Product ID to our order details table and form, creating a combo box to select products to be added to our order, creating a command button to add the product as a new item on the order using a Visual Basic module, build events, the code builder, our first programming: a "Hello World" message box, retrieving combo box data using Visual Basic, GoToRecord command, accessing combo box columns, #Name? error, using an If/Then construct, Refresh method, retrieiving data from tables using the DLOOKUP function, string concatenation in Visual Basic, tracking an address in your order, AfterUpdate events, error handlers. At the end of this class, we've greatly enhanced our Order Entry system. Now, instead of just manually typing products into our order form, we can select products from a Product Table and the information is automatically added to our order: product name, price, and so on. We've also learned our first bit of Visual Basic programming. 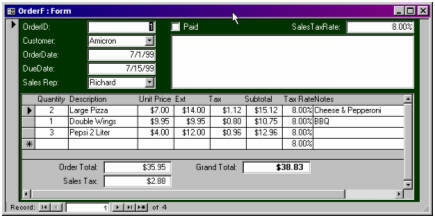 Advanced Reporting, building a credit limit report, using the SUM function in a report footer, adding page numbers, horizontal lines, report header/footer, the difference between the report header/footer and the page header/footer, creating a printable invoice/quote for our Order Entry system, adding an IsQuote field to our Order table, adding a quote/invoice toggle button to the order form that changes color and caption when changed, changing object properties using Visual Basic and events, OnCurrent event, building an order query that relates multiple tables together, join types (inner, outer), sorting and grouping in reports, creating a group header/footer, report properties, force new page, page margins, creating a label and changing the caption on the fly based on data in the report (invoice/quotation), report section build events, adding a graphic (logo) to your report, adding totals to the bottom of yoru invoice, can grow/shrink, adding a command button on your order form to open the invoice for that order. At the end of this class, we now have a fully usable Order Entry system complete with a printable invoice/quotation that can br printed out and given to our customer. And, of course, all of the data is stored safely in our database. So if you're serious about learning how to build Access databases, this seminar is for you. This is the complete video recorded from one of our previous Access seminars. It covers all seven-hours of the course. Richard on 1/1/2007: Learn how to build Access databases from the ground up. This course will teach you everything from the basics of building tables and forms all the way up to the more advanced features - and even a little programming. The course consists of SEVEN (7), one-hour sessions. marlena gracia on 1/24/2008: In lesson 4 you talked about Salestax and when we added the tax to the table your tax calculated to 8.0% and mine calculated to 800.00% how do i fix that? Richard Rost on 1/24/2008: Remember, you have to enter percentages in as fractions: 0.08 or 8% with the percent sign. Jessica Massie on 11/18/2008: I'm using this with Access 2007, and when I go to create a form using a query, it comes up in a grid in which I can't move the fields separately from each other. Do you know how to do this? Scott Rowe on 1/14/2009: Can you have a standardized prefix in front of a number that is always shown on a form in field? Richard Rost on 1/21/2009: Scott, can you give me an example? Scott on 1/22/2009: The text box would be an autonumber that would display the autonumber and a standard prefix. Ex. "2009- autonumber". Richard Rost on 1/22/2009: Scott, you're going to have to create your own counter. You won't really be able to use an Autonumber for this. See this tutorial for help. Scott on 1/22/2009: Thanks Richard. That will do the trick. Scott Rowe on 1/30/2009: I am trying to build a query that allows me to search for subjects using many different criteria specific to each subject. Do I have to build seceral querie's or can this be done through a single query? Richard Rost on 1/30/2009: Scott, you could use one query to specify multiple criteria - even for the same field. Just keep the AND and OR conditions in mind (the OR rows). I cover this in detail in ACCESS 102 and I also know I talk about it in the Seminar as well. If you want to build your own search routine, however, it will require a little VBA. I cover building a custom search button in Access 307. In an upcoming lesson, I'm going to cover building a more complex search form. Red on 10/2/2009: In your Contact phone message table, is there anyway to have the number pop up automatically without switching between the two tables?? Richard Rost on 10/4/2009: Red, when you say "pop up automatically," what exactly do you mean? If you're referring to something specific in the video, please let me know the time index so I can review it. It's been several YEARS since I recorded this seminar. I have tried to understand how get the full name of a field while on the design view properties. For instance you created CustomerID as a primary key and when you want to find the full name, you click somewhere on the design view window, but I don't know where, but you came up with =Forms!CustomerF!CustomerID. Please advise. Thanks. Richard Rost on 10/26/2009: Go to design view on the form. Now double-click on a field to bring up it's properties window. The NAME of the control is what you're looking for. See this tutorial on for more help. Richard on 7/27/2010: You can download the HANDBOOK for this seminar by logging in to the 599CD THEATER and loading the Access Seminar 1 course up. Richard on 5/14/2012: Yes, there is a problem with his video at around the 44 minute mark with the Flash player. Try using the WINDOWS or HTML5 player. Craig on 5/7/2013: I'm hesitant in purchasing the Access Seminar 1 as it seems to cover a lot of what I've already purchased and gone thru so far in 2010 Beginner, 202-223, Expert 1-4. I'm currently working on a db for my business which syncs with outlook (to handle contact details). So far I have the contacts syncing to an Access Cust List and Details combined form and a compare and backup setup. I've just got the Order forms working with a cust-orderlist attached to an order header and orderline subform (although that was fun getting the combo boxes working off each other on the subform - learnt some good lessons there!). Anyway just to give an indication where I'm at to say, is it worth redoing a lot of the stuff in the seminar? I wouldn't bother buying this seminar since you already have the lessons that cover a good majority of it. This seminar was one of the very first things I recorded over 10 years ago, and it was recorded from a LIVE session I held on the Web, so it's nowhere near as polished as my newer lessons. If you want to keep learning, I would recommend move on with the next lessons in the 2003 series, or wait for Access Expert 5 which should be out in the next day or two. Tanya Gibson on 11/12/2013: I want to create a Survey asking for information. Where do I create this survey, in forms? I work for a doctor and I want to know how the patients feel we are doing. I don't need tables created, because the survey doesn't have names. I didn't know if I create a form or a report. Trying to apply this database to our needs.